Pretty knees are essential for women who wish to show off their legs. Unfortunately, fat around the knees can ruin your entire look in a short skirt or dress. While you can't target just one area for fat loss, you can tone up the areas around your knees by losing overall body fat and performing lower body strength training exercises. Remember to check with your physician prior to starting any workout regimen. Lunges are key to strengthening and tightening the upper leg. Perform three sets of 10 lunges with one minute rest in between. Step forward with your right foot and bend your leg so that your knee is at a 90-degree angle above your ankle. Push back up to your starting position. Complete the next lunge with your left foot forward. Continue to alternate legs throughout the set. Maintain your posture as you perform lunges so that your spine is straight, your shoulders back and your head level as you look forward. According to the Smart Fitness column on the MSNBC website, these exercises tone the quadriceps, which helps keep the knees from appearing "droopy." Leg extensions are another beneficial exercise for toning the muscles around the knee area. You can use a leg extension machine at the gym or you can invest in a home machine. 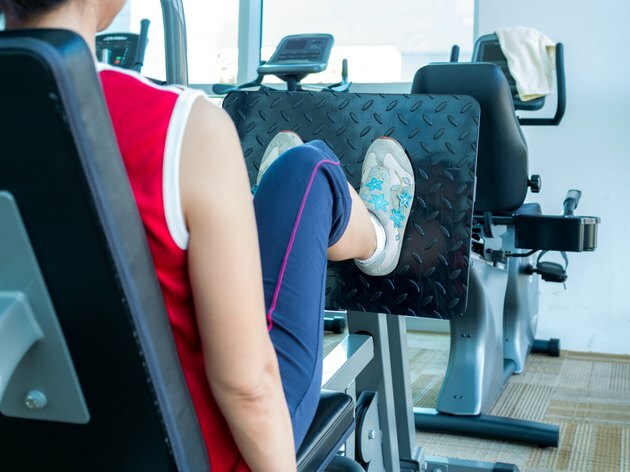 Sit down on the seat of the machine with your legs pushed against the padded bar. The bar should rest on the tops of your ankles. Extend your legs slowly until they are almost parallel with the floor, then lower them back to the starting position with control. Perform three sets of 10 with a one-minute rest in between sets. The BetterU Inc. website recommends you control the momentum and do not perform explosive moves while doing leg extensions to avoid injury. Another leg exercise that improves the appearance of your knees is squats. This time-honored high school gymnasium exercise can be executed anywhere. Stand with your feet approximately hip-width apart. Keep your torso upright as you bend your knees, lowering your buttocks towards the floor as far as you can, then slowly raise yourself back up to the starting position. Ten repetitions for three sets are enough for one day's workout. Adjustable exercise steps are great leg-toning tools. You can purchase these padded steps at most sporting goods stores, and they are fairly inexpensive. To use the equipment, you simply place it on a level floor and step one foot up and then the other. Step back down to the floor one foot at a time and repeat for three sets of 10 repetitions. Take a one-minute rest in between each set. Maintain good posture, making sure not to lean forward as you perform each repetition. To increase the challenge, increase the height of the step. In addition to exercises to tone and shape your legs, make sure to follow the guidelines of the Centers for Disease Control which recommend participating in moderately-intense aerobic activity 150 to 300 minutes a week. Any aerobic exercise, from brisk walking to cycling to swimming will help burn calories and tone your muscles. Msnbc.com: Health: Fitness Fixes for Chubby Knees and Bra Bulges? Can You Do Home Exercises to Slim the Knees?